This is a great activity for kids during these never-ending days of winter. This post first appeared on the HomeFamily blog in January, 2012. Winter is well upon us; the ground is covered with snow, what a great time to see whom you can invite to your yard. For many of us living in the city our chances to interact with nature decrease when winter arrives. There are many ways to encourage birds to visit your yard, offering great learning opportunities and hours of entertainment. 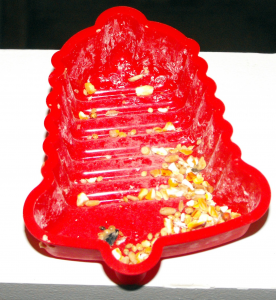 During the winter it is difficult for birds to find enough food. 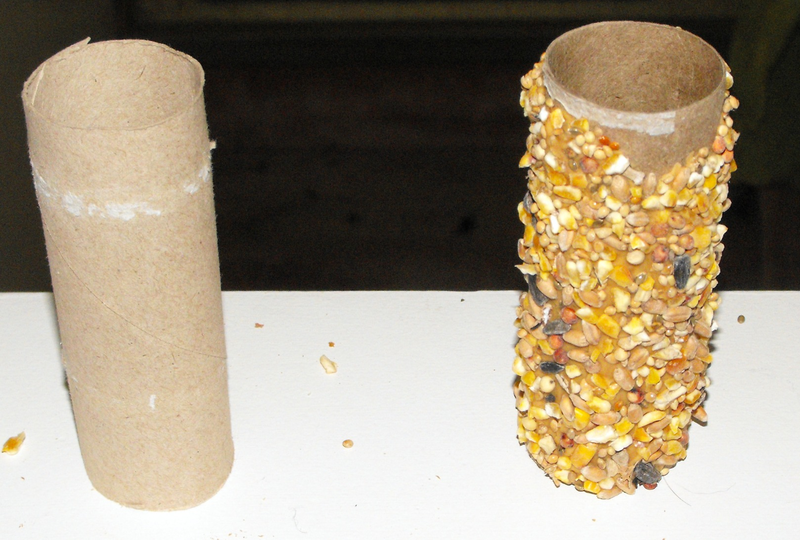 There are many easy ways to make food available to birds. We will discuss several feeders that can be completed as a family. Some of the feeders are geared towards parents and younger children, while others are for older children on their own can complete. Peanut butter is used for most of the feeders discussed, however in most cases honey can be substituted for the peanut butter. If you are comfortable using suet (rendered fat), you can also use it in place of peanut butter. Spread peanut butter on a toilet paper roll. Then roll into birdseed until covered. You can slide the roll onto a tree branch. Toast some bread then using cookie cutters cut out pieces. 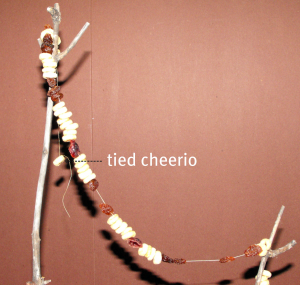 Using a needle and thread (adult should do this) create a loop to hang the toast. Place the toast in a tree, shrub, or on a planter hook. Place the left over toast in a tree as well, using the hole created from the cookie cutter. String cheerios, craisins, and raisins onto a thread. Then you hang from anywhere. 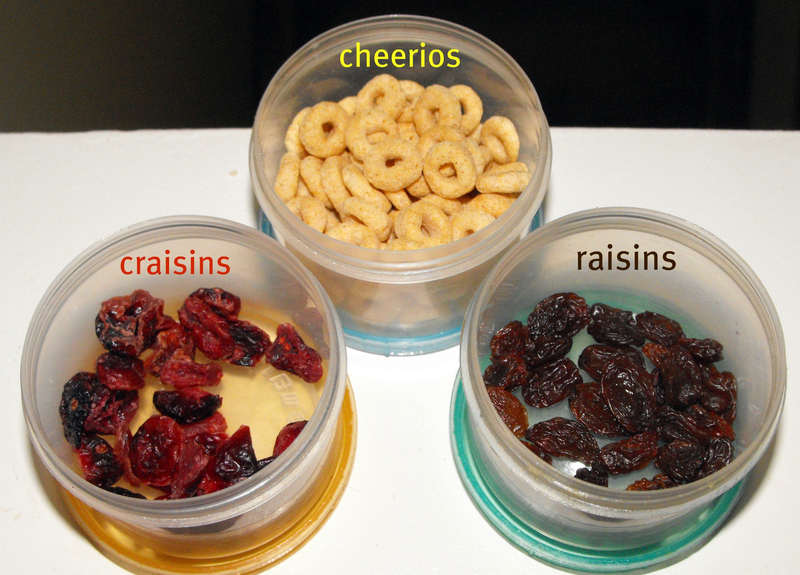 To make sure food doesn’t fall off, tie the thread around the first cheerio. 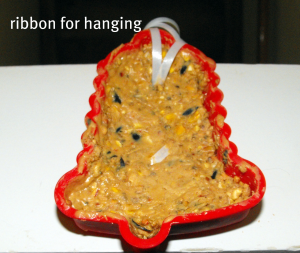 You can also mould birdseed shapes to hang in your trees. Start with peanut butter and add birdseed until you have a cookie dough consistency. Place the mixture into a silicone mould. Add a ribbon hook, them more mixture, and place in the freezer overnight. The next day pop the seed out of the mould and hang outside. This one will only work in the winter when it can remain frozen. Of course any of the above can be made by children of any age, but sometimes the older kids want to do a project a bit more involved. 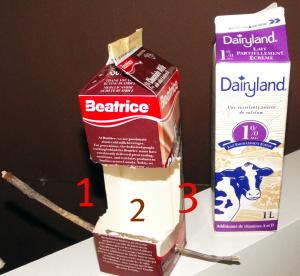 Using a milk carton cut away three of the sides. When you do this you want to cut a minimum of an inch from the bottom (this is where you will put the seed when you are done. Then poke a small hole on the sides that have been cut away. Find a twig that will stick out a couple of inches on each side and push it through the hole. The birds will be able to stand on this when feeding. 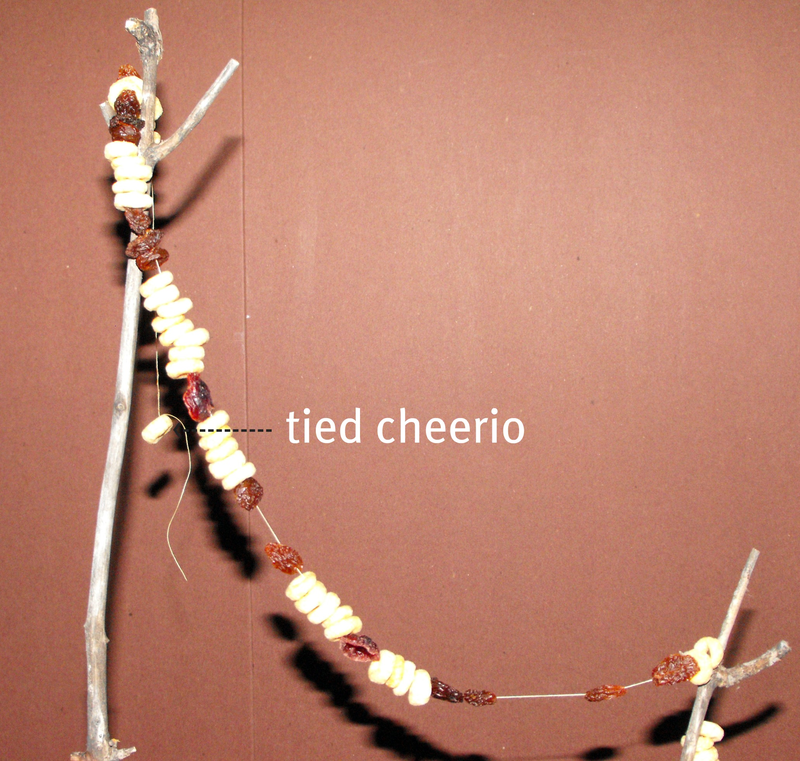 Finally, poke a hole in the top, tie a string through it and hang the feeder outside. Don’t forget to put birdseed in the bottom! Nancy is a Professional Home Economist and has been employed by the University of Manitoba for over 23 years. She has held management, administrative, and instructional appointments. Her educational background includes child development, communication, human resources, and management. She has experience working with pre-schoolers and their families, university students, as well as adult learners.